Canada's largest 10K road race, the Vancouver Sun Run, took over the downtown core on Sunday with nearly 40,000 runners taking part. Canada’s largest 10K, the Vancouver Sun Run, featured more than 39,500 participants on Sunday morning. While it was a Canadian sweep in 2016 – with wins by Eric Gillis and Lanni Marchant – this year’s race featured two victories by U.S-based athletes. Joseph Gray, a world-class mountain runner for the United States, won the men’s 10K in 29:38. Three other men – Geoff Martinson, Daniel Kipkoech and Tristan Woodfine – were able to break the 30-minute mark in the iconic downtown Vancouver race which features a notably fast start. Gray is the 2016 world mountain running champion. He is also the three-time winner – 2014, 2015 and 2016 – of the famed Mount Washington Road Race in New Hampshire, a notoriously tough event which ascends 1,400m at an 11 per cent average grade. Karolina Jarzynska-Nadolskz, who is Polish and resides in Colorado, according to her residence in the final results, won the women’s race in 32:39 as four women – Kinsey Gomez, Rachel Cliff and Emily Setlack in addition to the winner – broke 34 minutes for 10K. Both winners made their Sun Run debuts in a field filled with experience including Cliff, the 2014 champion. Appropriately, the race required a large venue to house all the runners post-race. Fortunately, B.C. Place Stadium, the home of the B.C. Lions, a Canadian Football League team, is located nearby which created a pretty impressive scene as finishers began to crowd the infield. The race has consistently been Canada’s largest 10K and among the world’s highest attended footraces. In 2011, the Vancouver Sun Run had 60,000 entries making it that year’s largest 10K in the world. This year’s race was the 33rd edition of the Sun Run, typically held annually on the third Sunday in April. The standalone 10K begins at Georgia and Thurlow in downtown Vancouver and features a brief section in Stanley Park. The scene along Beach Avenue is a memorable one for runners as are the crossings of the Burrard Street Bridge and Cambie Street Bridge, which is the final notable landmark before the finish at B.C. Place. Among the runners on Sunday morning were two of Canada’s top racewalkers: Ben Thorne and Evan Dunfee. The two finished in 39:45 and 40:15, respectively, with Dunfee, the fourth-place finisher in the Olympic 50K walk, expected to contest the BMO Vancouver Marathon at the beginning of May. 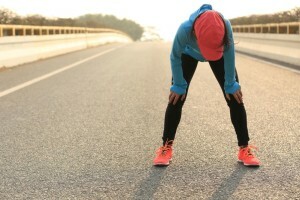 According to race timing company Sportstats, there were 39,768 participants – 20,900 women and 18,443 men – who took part in the Sun Run. 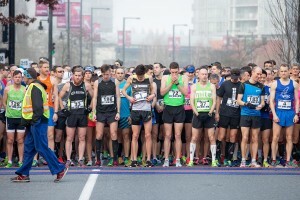 The Vancouver Sun reports that 39,744 runners participated. How much was raised by this and where does it go?